We now have 32 entries, so I shuffled the groups around to accommodate missing teams. Honduras replaces Peru in Group D. USA replaces Belgium in Group G. Iceland and Columbia will receive 10% point reductions for being late. Here is how voting works: Rank each team in each group. First place gets 4 points, second gets 2 points, third gets 1 point, fourth gets zero. Top two teams from each group will advance to the knockout round. In the event of a tie, the team with more first place votes advances. If you are a participant, votes in your own group will not count - but you can vote anyway. Voting for the knockout round will last through Saturday. Advancing teams will advance into knockout stage with same assignments as the real World Cup (A1/B2, C1/D2, etc.). Each knockout round will last 2 days (R16 Sun/Mon, Quarters Tue/Wed, Semis Thu/Fri, Final Sat/Sun). I encourage you all to zoom in on these concepts to see the detail. There's some pretty good stuff in here! 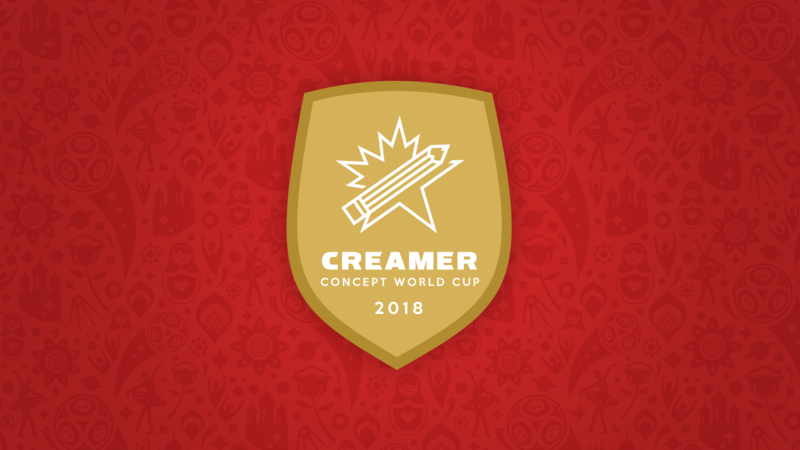 For 2018, the hosts of the World Cup receive an updated, yet used before logo. The two headed-eagle remains, with an updated look and a modernized design. "Russian Football Union" is written across the middle of the logo. For the home uniforms there is a mix of their current red color and their former dark red color. The color fades from red to dark red with golden stripes in between. On the back collar is a Russian flag. The white clash kit pays homage to Russia's first ever World Cup kit apart from the Soviet Union. 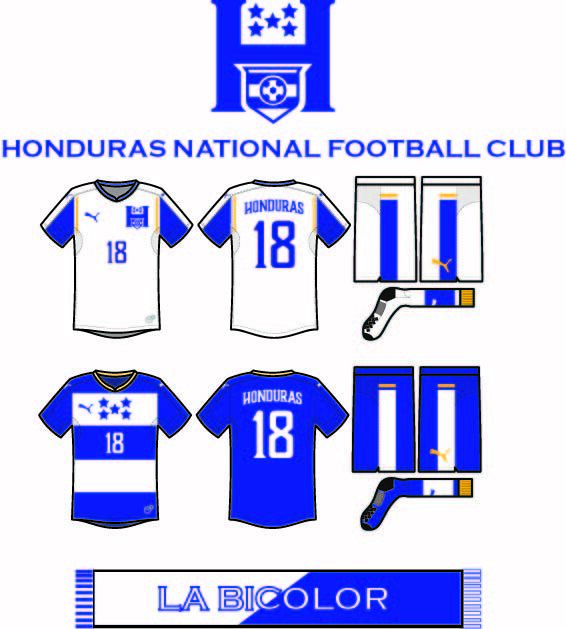 The 1994 kit was white with red and blue checkered patterns, but for the current kit it has been updated to have a sublimated look with a two-tone blue. 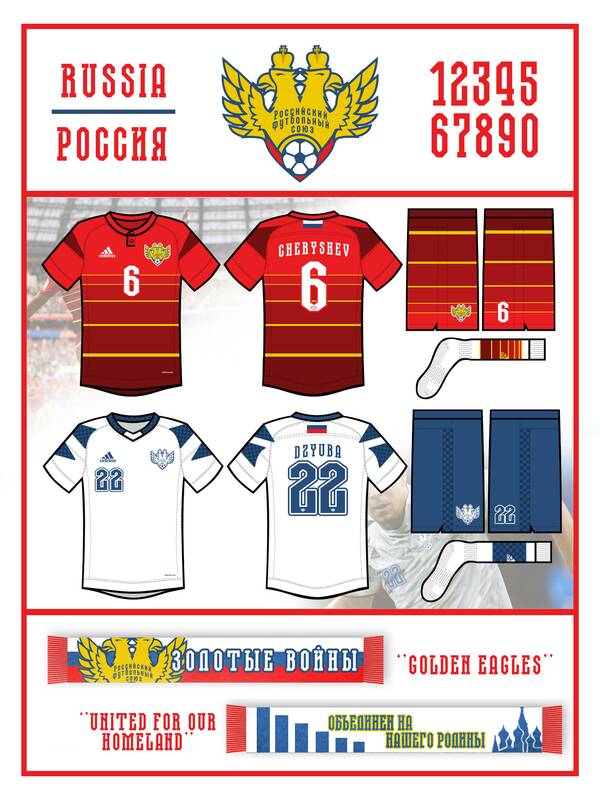 The scarf says "Golden Eagles" in Russian, which is a nickname of the national team. The other side says "United for Our Homeland" in Russian with the Kremlin on one side, and then stripes that are meant to represent the classic Russian matroyshka, or nesting, dolls. Uruguay is a team with a very traditional set. They are always recognizable with the light blue jersey over black shorts, so I kept this tradition alive with the primary set. I added a subliminal sun near the shorts inspired by the sun on the flag, with rays extending around the back for a little more flair. I also switched to the Nike template, which brings the subliminal sleeve design with it. The only other change to this classic set was to flip the black and light blue on the socks, making light blue the primary, only because it is a unique color that stands out. On the clash, I decided to darken the blue, to compare it to the royal blue on the flag, and use a hoop design, similar to the flag itself. 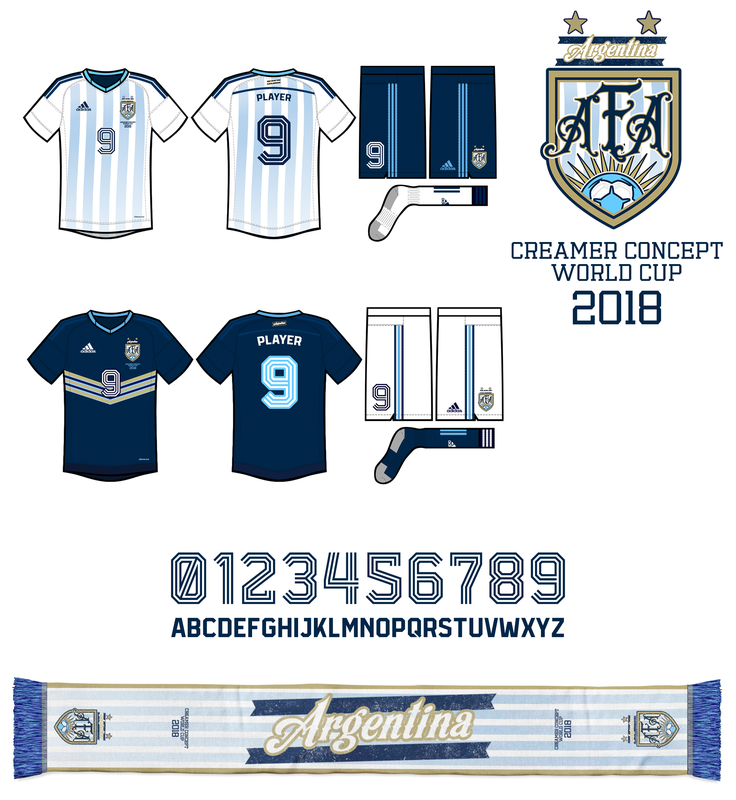 I feel that this could be a classic design that could eventually be recognizable to Uruguay, as they would be the only team with hoops in the tournament. Crest: I wanted to keep the Spanish Coat of Arms as central element of the design, making it larger compared to the current design. I chose a roundel shape, inspired by the designs used during the 30’s and 40’s. The logo features the acronym “RFEF” (Real Federación Española de Fútbol / Royal Spanish Football Federation), the foundation year of the federation, 1913, and the Spanish flag. I decided to keep the Royal Crown, but instead of placing above the Coat of Arms, it’s placed above the roundel, following the style of many Spanish clubs with the title of “Real” (Royal) in their names. Home Kit: the design seeks to combine the past and the present. It uses the latest Umbro template, featuring a classic pattern on the front made out of triangles. This pattern has two meanings: first, triangle is the strongest shape in nature, and in this case it symbolizes the strength and unity of the country; but also the triangles feature pinstripes at their bottom, representing the dynamism of the Spanish game style, the “Tiki Taka”. The colour combination chosen is Red / Blue / Navy Blue, inspired by the scheme used from 1981 to 1993 and brought back in 2015, changing the original Black socks for a more modern shade. Away Kit: the uniform features Navy Blue as main colour, inspired by the design used in the 2010 World Cup final. The secondary colour chosen is Blue, applied on the polo collar and the cuffs, to create a balanced and distinctive look. 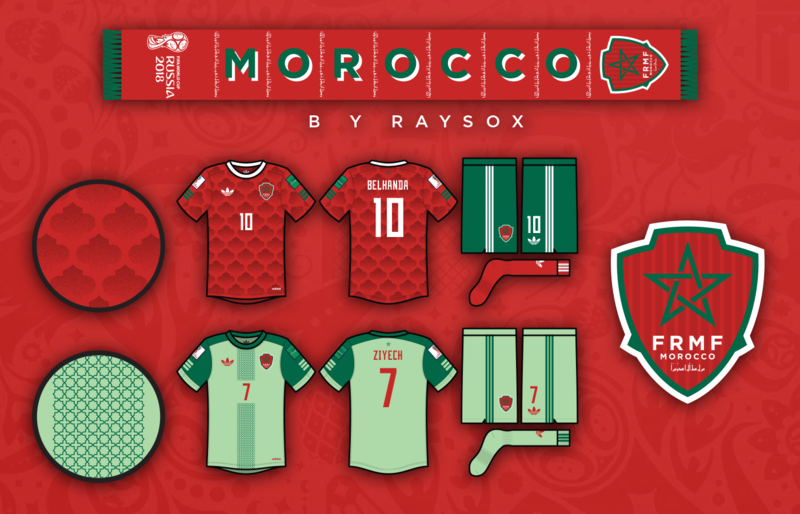 The design focus on the relation between the brand and the National Team, featuring the classic diamonds on the sleeves, mimicking the Spanish flag. The subtle pattern featured on the front is made out of Umbro logos, alternating between the current design, and the one used in the 30’s. Scarf: I kept it simple, using the Spanish flag all over the fabric except for the endings, which feature the new team crest over a Navy Ble background. It just features the word “España” (Spain), as well as the national motto “Plus Ultra” (Further Beyond) in a subtle way. 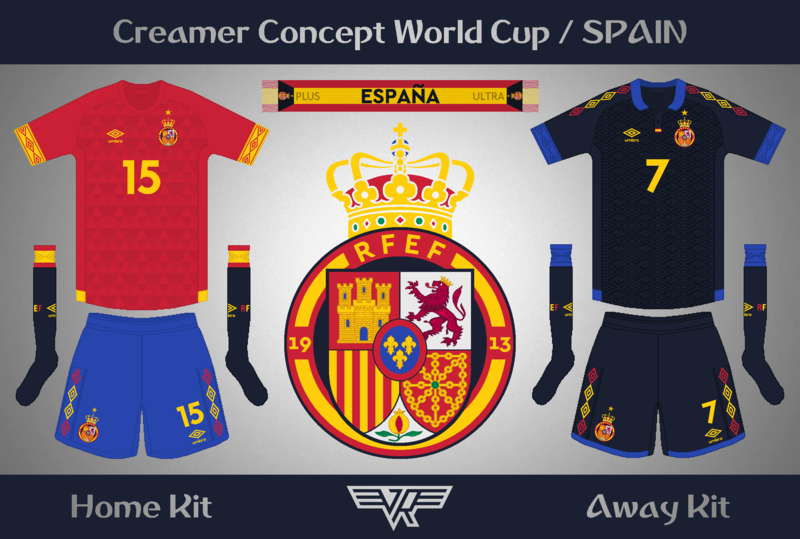 Brand change: Adidas might have been the kit manufacturer of the Spanish National Team since 1991, but I wanted to go for a “more classic route”, that’s why I have used Umbro as brand. 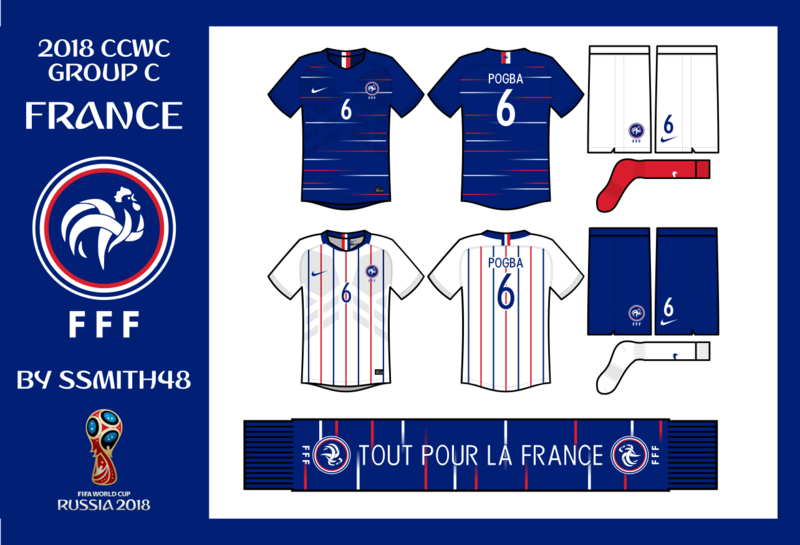 France's kits are inspired by both art and past French kits. The dark blue primary kit features "streaks" representing famous French art and painting, and is also inspired by the real life France clash kits, while still being simple and creative. The home kit is paired with traditional white shorts and red socks. The clash is inspired by the '80-'81 clash, featuring alternating pinstripes of red and blue. It is paired with blue shorts and white socks. All shorts and socks can be interchangeable if needed. Australia’s crest is inspired by the 7-pointed Commonwealth Star. The yellow primary kit features a sublimated wavy pattern evoking the sand dunes located in both urban and desert areas of the country. This pattern is composed of several elements commonly attributed to Australia such as kangaroos and boomerangs. Green shorts and socks complete the classic home look. 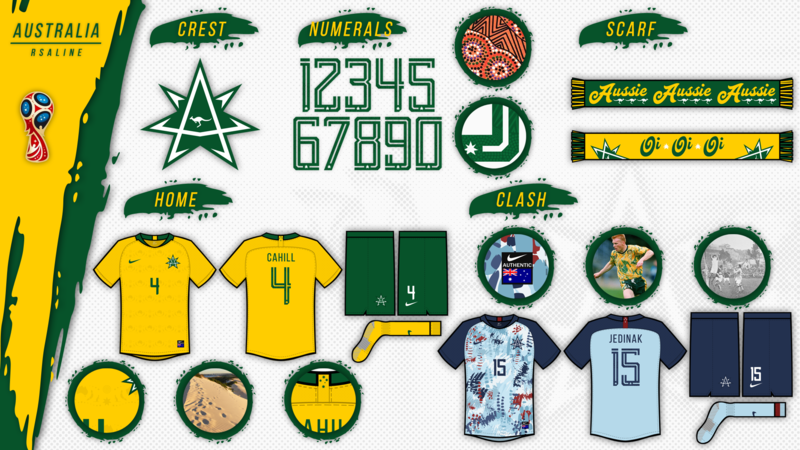 The clash kits draw from two aesthetic periods of Australia’s history. The light blue shirt with maroon sock stripes pays homage to the first Australian national team in 1922. The shirt pattern is inspired by the wildly popular kit that the Socceroos wore during 1994 WC qualifying. The two sided scarf features lyrics of a popular chant meant to rally supporters around their team, perhaps you’ve heard it? The Swiss cross is an underused element on Switzerland's uniforms, but in this set, it gets prominent use. The 11 Swiss crosses on the right side of the shorts represent Switzerland's 11 World Cup appearances. I decided to use a double red on the away kit while keeping the home red and white. The darker red creates a unique color combo on the road. The crest uses the same initials as the current one but becomes more simplified and less abstract. 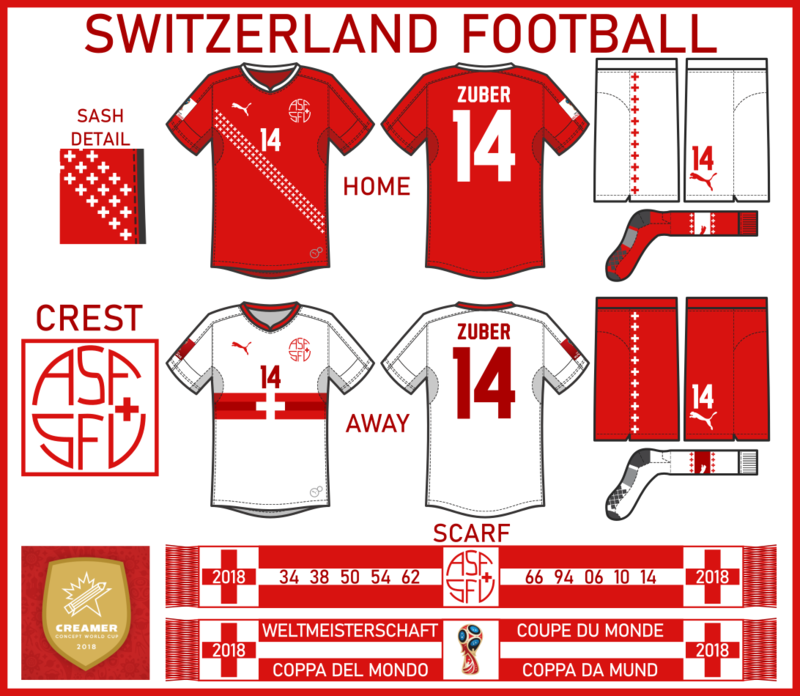 The scarf features every year that Switzerland has previously made the World Cup and the other side has "World Cup" in the four official languages of Switzerland; German, French, Italian, and Romansh. 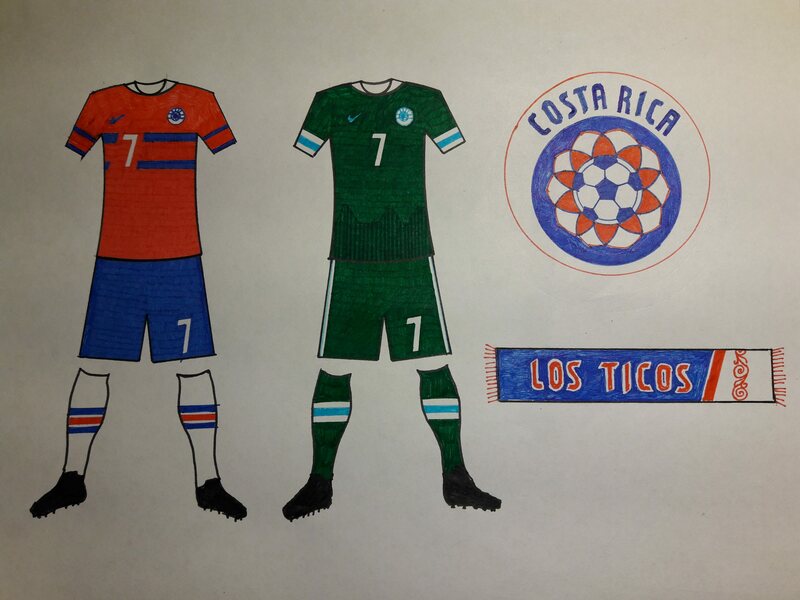 For Los Ticos, I wanted to continue Costa Rica's rich soccer tradition, while also changing it up and adding something fresh. 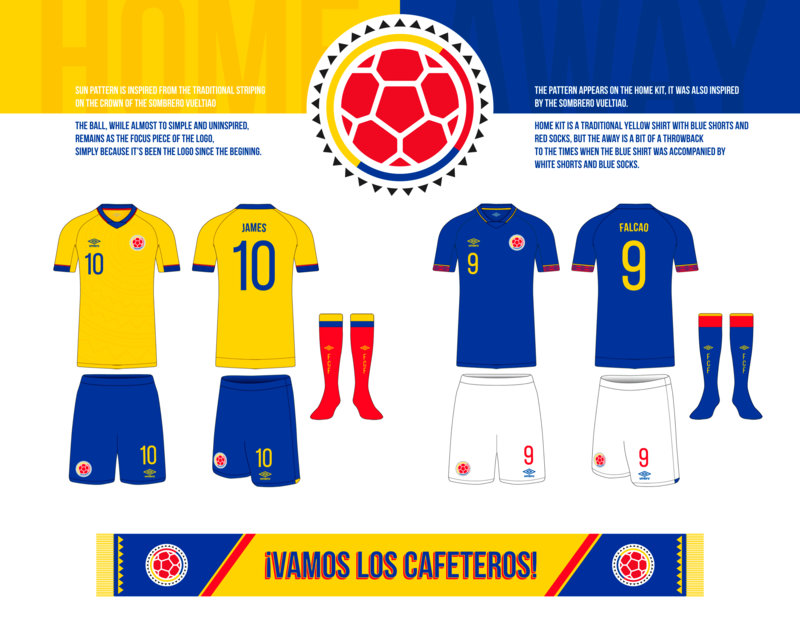 Primary: My inspiration behind this kit was the Costa Rican flag and their kits of the past. It features their usual red-blue-white combo. 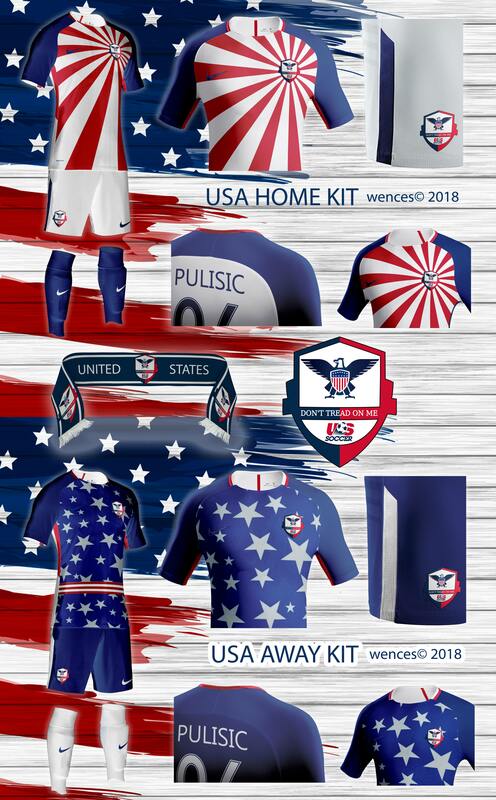 The jersey is mostly red with two blue chest stripes, which echos the two outer stripes on their flag, and the same design is on the sleeves. 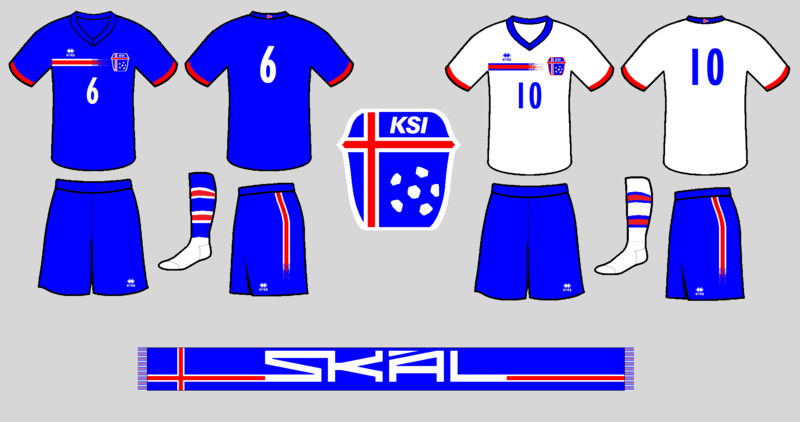 Secondary: This kit was influenced largely by the national coat of arms. The blue and green both come from the seal, as well as the sublimated three mountain design on the jersey, which represents the three mountain ranges of Costa Rica. Crest: The crest was inspired largely by the painted oxcarts of Sarchi, an important symbol of Costa Rican culture. The patterns on the carts vary quite a bit, but I chose one that was fairly common and used it in my design. Scarf: The scarf features the nickname of the national team, 'Los Ticos' with striping and a pattern that is also based on the Sarchi oxcarts. Serbia's history offered many different items of inspiration for this concept. The main focal point for the crest is the double-headed Serbian eagle, an image that has been used going back as far as the 10th century. I feel as though the two heads represent both the past and the future, taking note of tradition and looking forward to new possibilities. It is accompanied by the country's name in traditional Cyrillic font, with modern alterations, and the same shield shape that is on the Serbian coat of arms. Both kits pride themselves on details. The home set is patterned after the Serbian flag, and features a pattern on the chest based off of Pirot carpet, a style native to the European country. 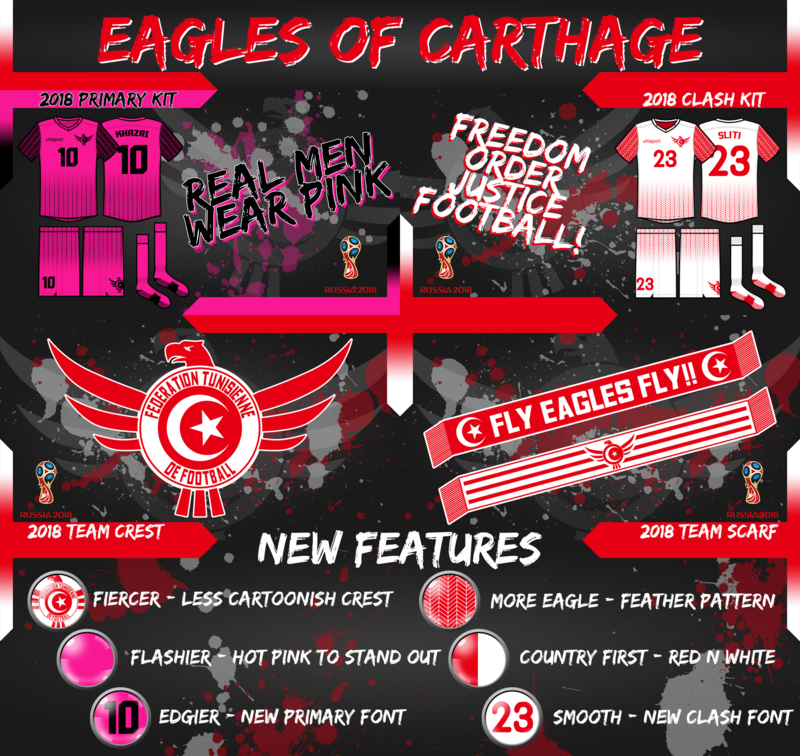 The clash kit is all gray, which relates back to the past and future that the Serbian eagle represents; the color of the castles of yesteryear, and the color of new architecture for the future, such as the Ada Bridge in Belgrade, the capitol. There is also a subtle line pattern that creates the Serbian eagle as well. 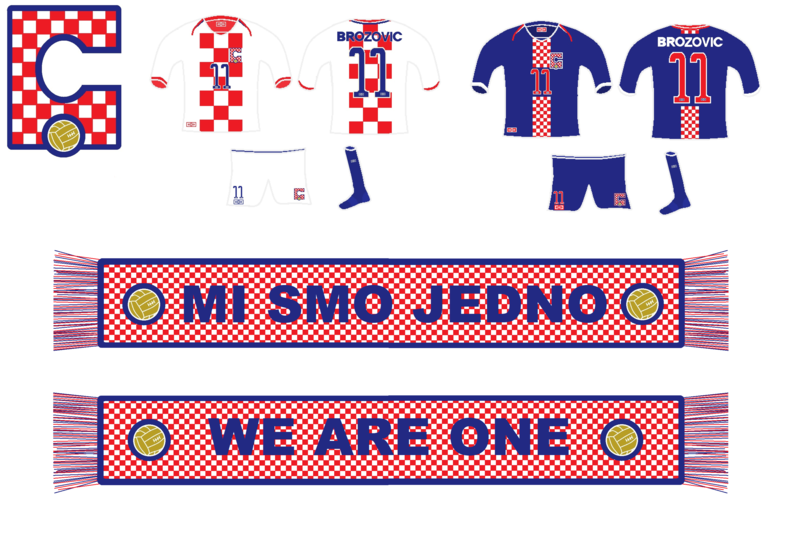 The scarf offers fans the opportunity to coordinate with whatever the team is wearing for their matches. This look is meant to be refined enough for a timeless look, yet bold enough for the future of Serbian soccer. Uniquely situated between the cultures of North and Central America, Mexico plays host to a variety of distinct traditions and cultural elements. Prominent among these is the image of the Aztecs, which has remained relevant to the Mexican national identity into the modern era. 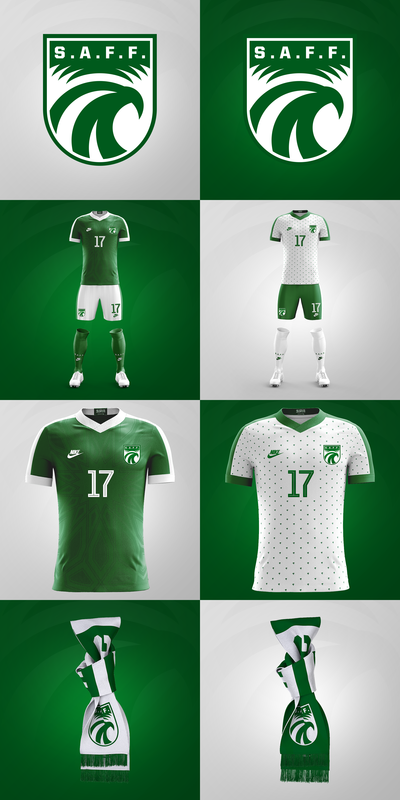 My redesign of the Mexican national soccer team seeks to merge this theme with the current icons of the team. The new crest forefronts the eagle from the national coat of arms at the top of the mark, rendered in the Aztec style. The lines from the wings of the eagle extend down into the shield, which forms the shape of a traditional soccer crest. Banners at the bottom of the crest retain the form of Mexico’s current mark. Bright gold and red feature in the logo, symbolizing the vibrancy of Mexican art and culture. 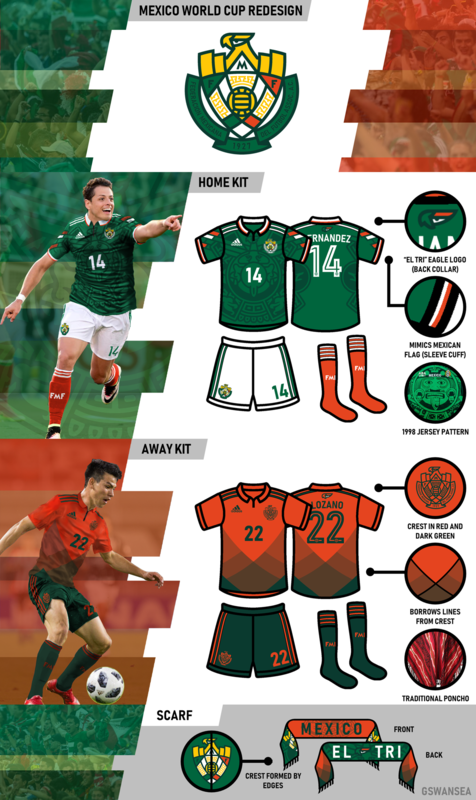 Mexico’s redesigned home kit features a completely redrawn version of the Aztec calendar that was boasted in the team’s jerseys from the 1998 World Cup. The wings of the eagle from the design extend seamlessly into the sleeve pattern, small diagonal sashes in the colors of the national flag. The away kit is inspired by Mexican ponchos, as various shades of red fading to green mimic the folds of a poncho. Logos on the away kit appear in red and dark green. In their first World Cup appearance post-Zlatan, Sweden rolls out a classy look that has ties to kit designs from their past. 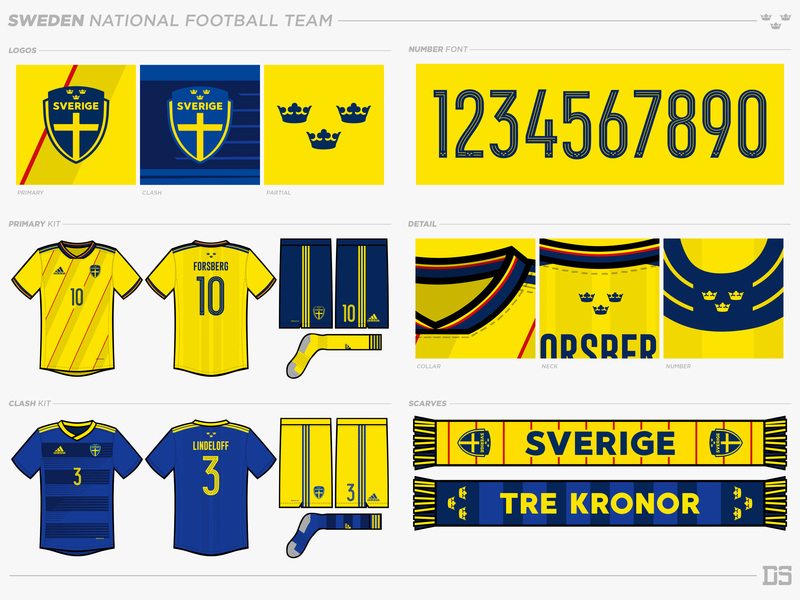 The crest retains the familiar shape and Swedish flag, but further emphasize the Tre Kronor, which translates to three crowns, and is the nickname of Swedish national teams. The crowns are also found at the base of the numbers and above the nameplate. Sweden's traditional home yellow introduces a new style of collar that resembles the 1994 version, worn by the 3rd place finishers at the World Cup. The diagonal pinstripes are based off similar designs from the late 80s and early 90s, while the more modern horizontal stripes of the clash provide a change of pace from the rest of the set. From the start, I knew South Korea was a good country to draw. It’s not an obscure country with little information to find on its cultural history, but not a giant country that has too much to choose from. 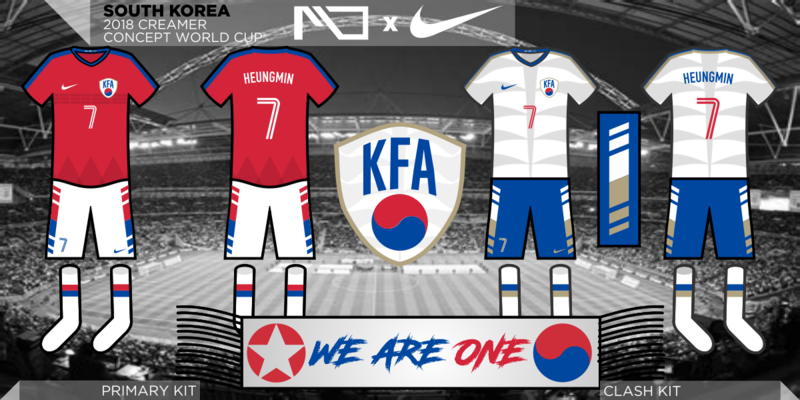 I often hear the phrase “for club and country” thrown around a lot, and I felt like that was a good base for my design, as South Korea has a rich history as a country, and their club has built an identity for itself. The crest shows a balance of these. I wanted something simple, but elegant and showing a blend of these. 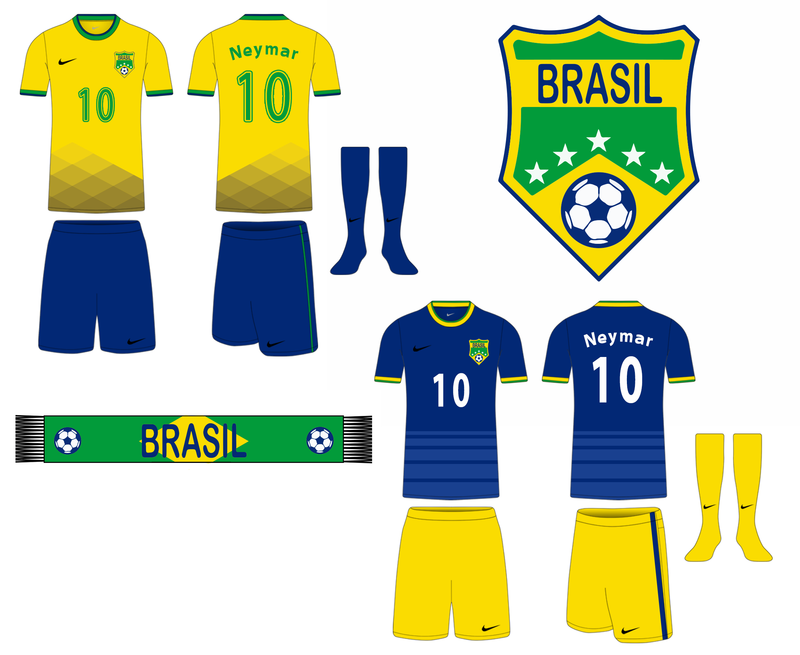 It uses the red, white and blue from the flag, as well as the gold the soccer team uses. The crest in the shape of a shield for the fearless warriors that have fought for one of the oldest populated areas in the world. At the bottom of the crest is the yin and yang symbol depicted on the flag. Sublimated in the shield is a tiger pattern, as the Korean soccer team is nicknamed “the White Tigers”. The primary red jersey is the “country kit” and features a single blue stripe from the neck all the way down the sleeves. There is a triangle pattern at the bottom of the kit representing the mountains scattered across the nation. at the chest, there are the four trigrams used in the national flag. They represent many things, such as the four seasons, the four directions and the four virtues. On the shorts, the striping pattern is a modernized version of the yin/yang symbol, with fading stripes coming off of the intersection. The white clash or “club jersey” takes full advantage the White Tigers nickname with a sublimated tiger pattern into the entire jersey. There are gold and blue racing stripes down the sleeves. The shorts are the same as the home but no longer represent the yin/yang in the flag as the colors are changed to white and gold. And finally, the scarf represents the talks between North and South Korea for possible peace and reunion. The phrase “We Are One” is on this flag as a motto for that. There is also a yin/yang symbol on foe side for the South and a star in a circle on the other for the North. The crest features a Harpy Eagle, the national bird of Panama, which is also featured on the nation’s coat of arms. The eagle swoops beneath a red soccer ball. Both symbols are surrounded by border, itself a stylized version of Panama’s flag. Finally, the roundel is completed with full name of the Panamanian Federation, FEPAFUT. 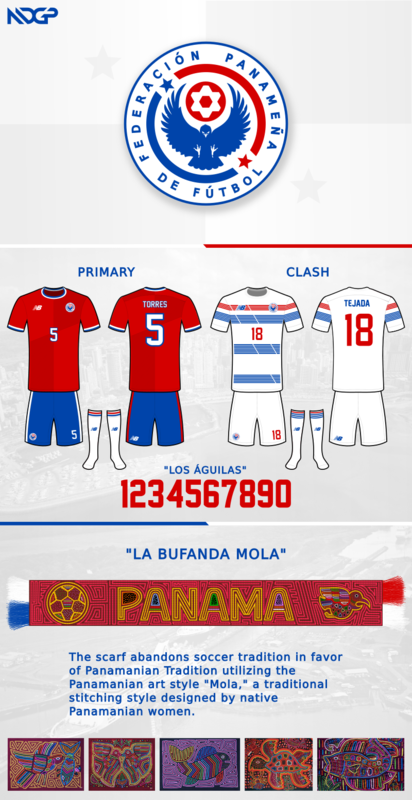 Panama’s primary kit features a red shirt whose main feature is a sublimated striping design that is split into the top right and bottom left corners, representing the four quadrants of the Panamanian flag. 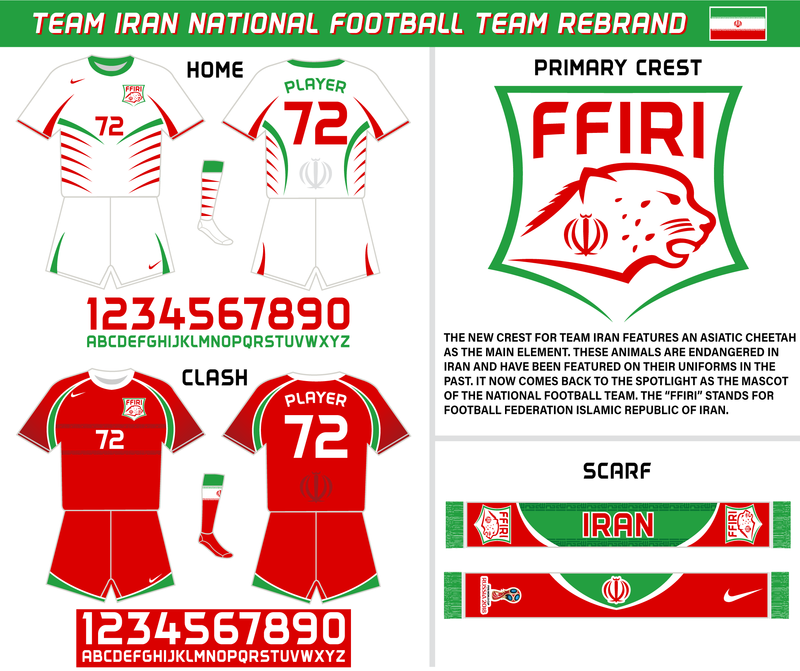 Each uniform element features a red-white-blue trim pattern. The Secondary kit is all white and features 23 stripes on the shirt. The 19 blue stripes and the 4 red striped represent the year 1904, Panama’s first full year in existence as a sovereign nation. Cutting through the stripes are two lines creating a phantom sash. This sash represents the Panama Canal, which cuts at a northwest angle through the nation. Both uniforms feature a subtle custom number font inspired by the angles of Mola stitching. The scarf is directly inspired by Mola art, one of the few non-European influenced art styles in Panama. Mola style features the use of bright fabrics intricately stitched in the form of stripes, dots, and shapes, generally depicting local animals. 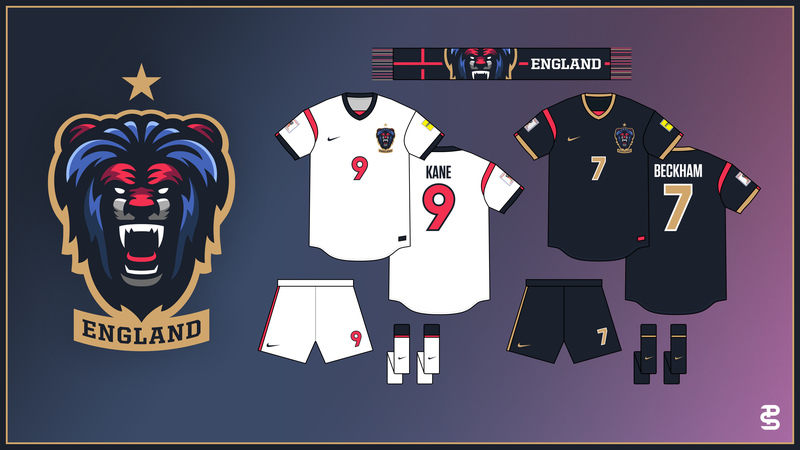 Here, the style is used to create the name Panama, as well as depict the soccer ball harpy eagle from the crest. The scarf fringe is quartered, based on the national flag. The Polish crest traditionally has been an ornate eagle that you may see being used on many regional symbols. The Polish team is known as the “White and Reds” and the “Eagles”. For the crest, I chose to modernize and simplify their traditional white eagle on a red shield. The scarves serve as a call to action. 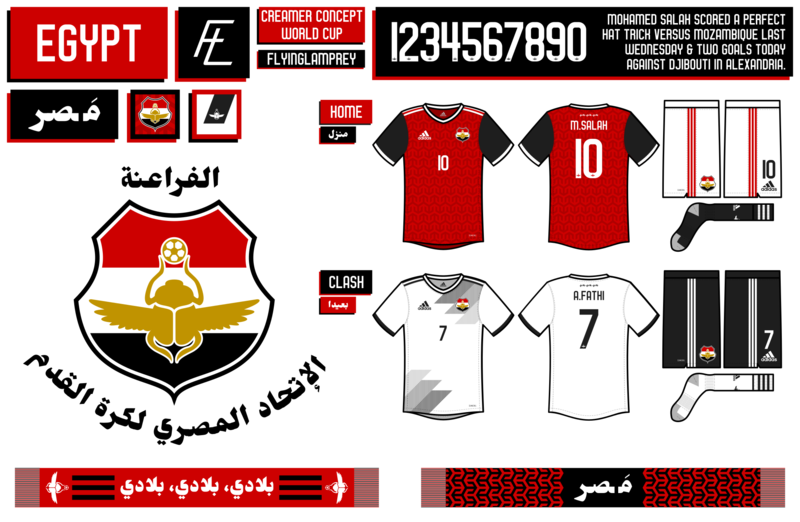 I wanted the scarf and the uniforms to be playful and to be a differentiator for the team as they try to stand out in a see of many other white and red teams. The primary kit stays true to tradition. Poland always wears a predominately red cladded look during international play. 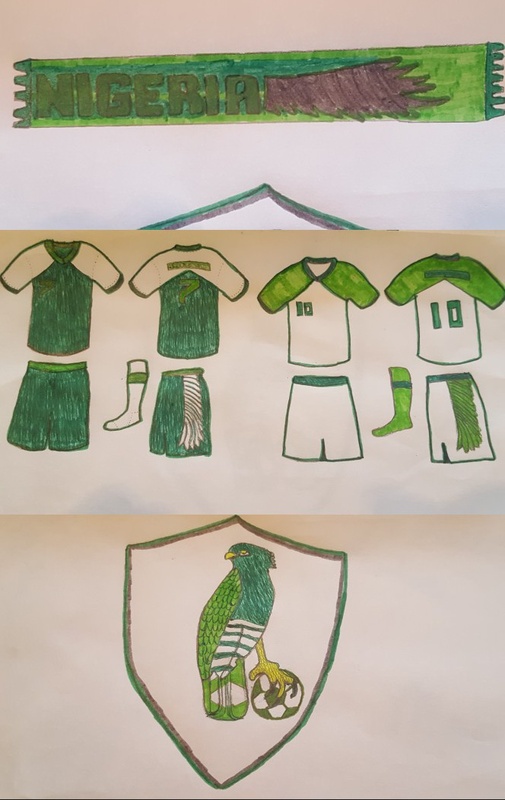 The jersey features the new crest over the heart; the eagle from the crest is used as a watermark across the front and the back of the shirt. The newest element of this uniform is the use of the light polka dots found on the sleeves. The polka dot is a traditional pattern found in Poland and I thought it was time that the Poland National Team embraces it. The clash kit makes the polka dots more pronounced. I hope that I found a good balance of using the dots without being annoying with them. I would like to think that Poland could embrace the polka dots like Croatia is with their checkers. In future iterations of these uniforms, the dots will be able to be used differently. The new look of Senegal was introduced with the help of Nike after many year of Puma as technical sponsor. 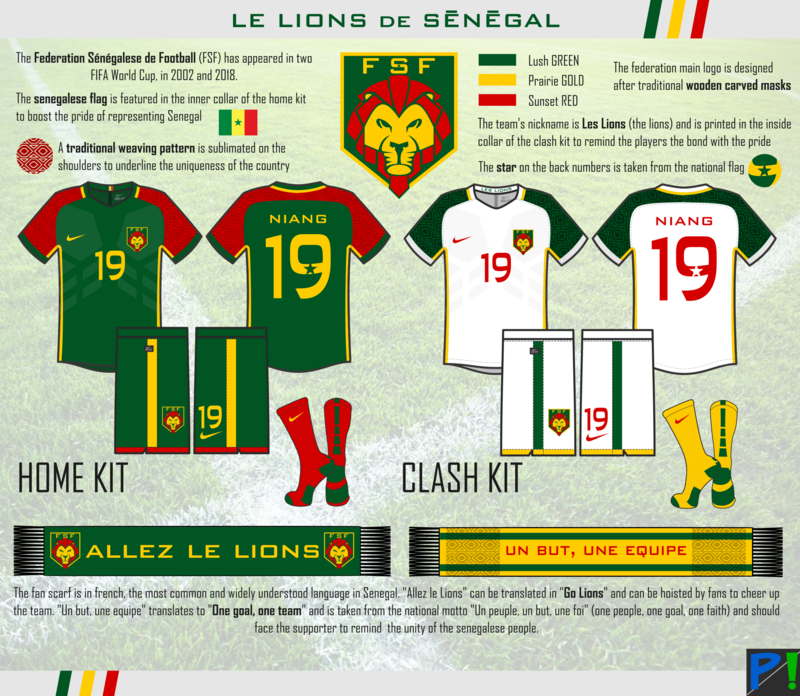 The addition of red in the color scheme comes in an attempt to modernize the team look by connecting it more with the senegalese national flag. Japan currently has an appealing identity, so I preferred tweaking what already exists over starting from scratch. The result is still far removed from what is on the field this year. CREST I remixed the elements currently in Japan’s crest. The yatagarasu, a three-legged crow representing the sun, is faced forward for a strong triangular shape, embracing the sun from Japan’s flag. Style lines have been added to the sun to add dynamism and hint at the seaming of a vintage football. PRIMARY I retain the traditional blue for Japan’s primary kits. The white stripe consists of yagasuri, a traditional Japanese pattern representing the fletching of arrows and symbolizing luck and determination. CLASH I reverse the coloring of the current shorts and jersey. The chevrons are made up of seigaiha, an ocean-wave pattern that connotes good luck. Vote Uruguay!!! 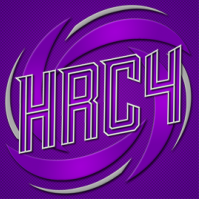 but being serious, great job to everybody who submitted a design, they are all amazing. I can't decide on what the group of death is this year. I also can't believe how many countries use an eagle as their mascot. I mean I knew..but didn't at the same time. Great work, everybody. I also like waffles. And French Toast. One question. Can there be ties? And how many points does each team get if there is one? Ok I guess that's two questions. No ties is voting. Ties in points decided by 1st place votes. Great job everyone! Each concept was great! Thanks @rsaline for putting this on. A good healthy competition helps hone the craft. There's a lot of talent in this pool.